Starting her off young. Beyoncé was in her hometown of Houston helping victims of Hurricane Harvey on Friday, September 8, and she had one very special helper — her daughter Blue Ivy. 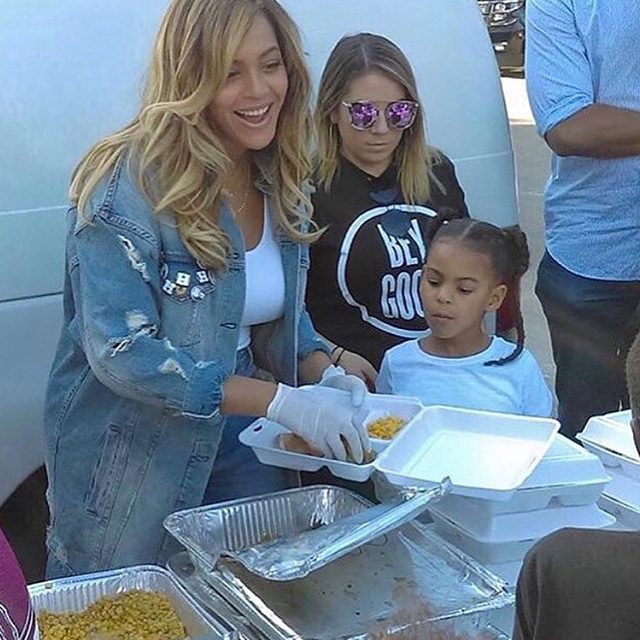 In a series of photos posted on her Instagram account, the Grammy winner and her Beygood team worked to help those who lost their homes in the devastating natural disaster, serving food and posing for photos as she hugged and talked to the victims. As previously reported, the mother of three also stopped by St. John’s Church with Blue, her mother, Tina Knowles Lawson, and Destiny’s Child member Michelle Williams. Earlier in the day, Lawson and Williams served lunch to 400 of the hurricane’s victims. At least 70 people died in the hurricane that hit Texas at the end of August, dumping several feet of rain and causing catastrophic flooding.